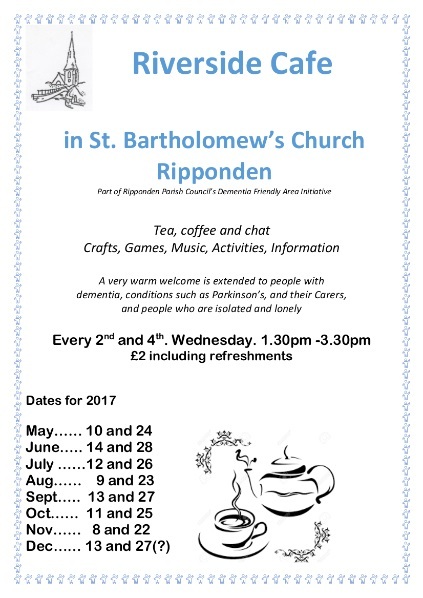 Get down to the Riverside Cafe at St. Bartholomew’s Church in Ripponden. A very warm welcome is extended to people with dementia, conditions such as Parkinson’s and their carers as well as people who my be isolated or lonely and just want a cup of tea and a chat. This entry was posted in Aug, Get Involved / Have Your Say, July, June, Mar, May, Nov, Oct, Sep and tagged Calderdale Carers, Dementia, Do Something, Parkinsons, Sowerby Bridge, Staying Well.